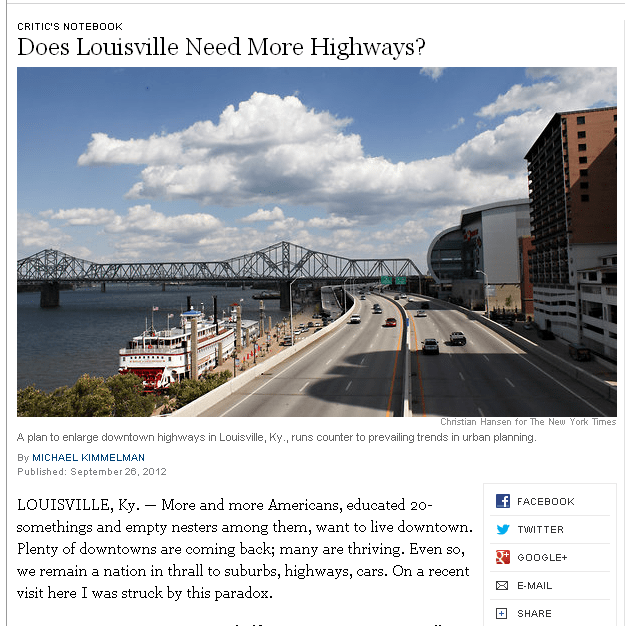 NYT: Does Louisville Need More Highways? My dad grew up in Louisville. My parents met and married there. Aunts and uncles and cousins from both sides of my family have lived there for many decades. I don’t get to Louisville all that often anymore, but it’s a city that fascinated me as a child an hour away in Frankfort and it’s a city that still fascinates me today. Long before I started writing about urbanism, I was intrigued by Louisville’s downtown — the vast empty blocks dotted with so many gems. Of course, the downtown was once filled, not just dotted, with architectural gems, and the streets bustled with life. Still, Louisville has a certain allure, a palpable history that has been built upon by new developments like the 21C Museum Hotel. I’m not the only one who’s drawn to Louisville. A recent study ranked it ahead of all the other 50 largest metro areas for attracting new migrants aged 25-39 with a Bachelor’s degree or higher. All this despite some horrible choices about the use of downtown space. Louisville is along a lovely, wide stretch of the Ohio River, but most of the river is cut off from downtown by highways. And now there are plans to increase the space devoted to highways and to build another bridge to Indiana, in hopes of achieving a number of economic development goals. That’s the subject of a great piece today in the NYT by Michael Kimmelman: Does Louisville Need More Highways? A half-century or so ago Louisville, like so many American cities, bet the farm on cars and suburbia. It sacrificed a swath of its downtown to three interstate highways. There was the usual reasoning: highways would bring business, without which downtown, already struggling, would shrivel and expire. Blocks of historic commercial warehouses and banks were leveled as a consequence; the center of the city was severed from Louisville’s spectacular waterfront; mass transit was largely abandoned and many corners of town transformed into parking lots. Around the same time the construction of a plaza and a hotel, along with a Mies van der Rohe building that commanded a singular view of the falls on the Ohio River, aspired partly to reconnect the city to the water. But the completion of the big John F. Kennedy Memorial Bridge leading into downtown capped off the massive entanglement of highways that produced what locals came to call Spaghetti Junction. But this ring road plan is tethered to the scheme to expand the downtown interstates and build another new bridge, next to the Kennedy. That idea is backed by politicians aligned with business leaders, who argue that many drivers here won’t want to use the ring road and that without the second new bridge to downtown, the joined-up ring road would encourage jobs to leave for Indiana. It’s true: ring roads have in the past encouraged American sprawl and have diverted jobs from struggling downtowns, but demographic patterns and traffic engineering are evolving. Adding more lanes doesn’t turn out to reduce traffic. It increases traffic. The phenomenon is called “induced demand.” The reverse is also true: fewer roads ultimately tend to produce less traffic. As for the notion that expanding the interstate tangle and adding the sister bridge next to the Kennedy might bring more people and jobs into the city, I can only say that 40 years after the interstates supposedly started pumping life into Louisville’s downtown, the streets here looked pretty empty to me, especially at night. Maybe that’s an outsider’s misperception. But removing the highways, or downscaling them, might turn downtown and its adjacent neighborhoods, including the riverfront, into more attractive places. And where highways have come down in other cities, property values have gone up. What brings life to a city are attractions, services, homes and walkable streets.